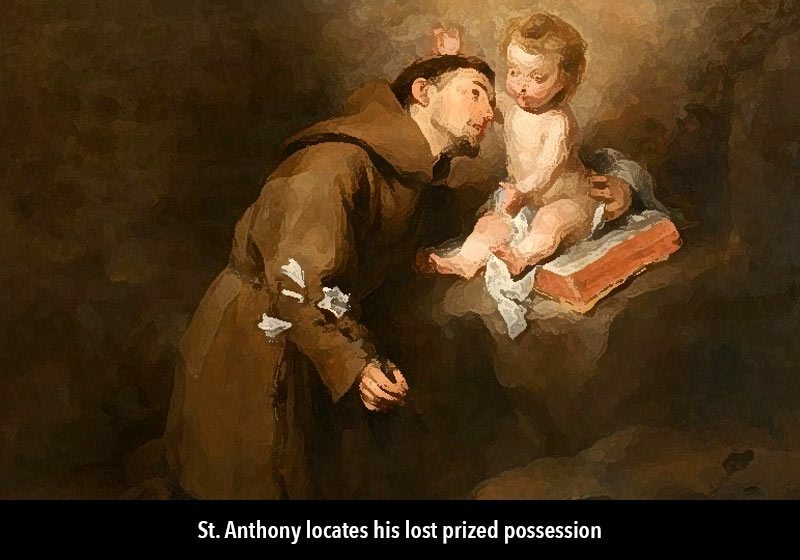 St. Anthony is popularly known as the patron saint of lost items, but did you know he’s also known as the patron saint of amputees and is often regarded as the “miracle worker” for all the miracles he performed even when he was still alive? The feast of St. Anthony is celebrated every June 13. In honor of this saint, let’s take a closer look at his life and how he earned these powerful titles. We’ll also discuss interesting facts about this famous disciple of Jesus. St. Anthony, or St. Anthony of Padua (a city in northern Italy) as he is also called, isn’t actually Italian. He was born in 1195 AD in Lisbon, Portugal into an influential family, and was given the name Ferdinand. His father was a captain in the royal army and had high expectations for his son to achieve great success in his life. St. Anthony soon discovered that he had no desire to live a life in pursuit of wealth and success; instead, he wanted to live a life devoted to God. To the disappointment of his family, at the age of 15, St. Anthony moved into the Augustinian Abbey of St. Vincent near Lisbon and joined The Canons Regular of St. Augustine—a religious order. This order was regarded for its scholarly pursuits and it is here, where St. Augustine gained a vast amount of his theological knowledge. At the age of 25, he was ordained a priest. St. Anthony spent his final years in Padua, the city most associated with the saint. In 1219, St. Anthony encountered a group of five men who were dedicated followers of St. Francis (Franciscans) on their way to Morocco to preach to the Muslims. 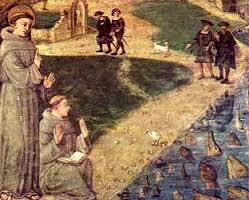 St. Francis was intrigued by their simple lifestyle and their pursuit to spread the word of Jesus. A year later, word was received that the five men had been martyred in Morocco and their remains were being sent back to Portugal to be venerated at relics. St. Anthony was so moved by the heroism of these men that he decided to join the Franciscan order. It is here where he adopted the name Anthony. 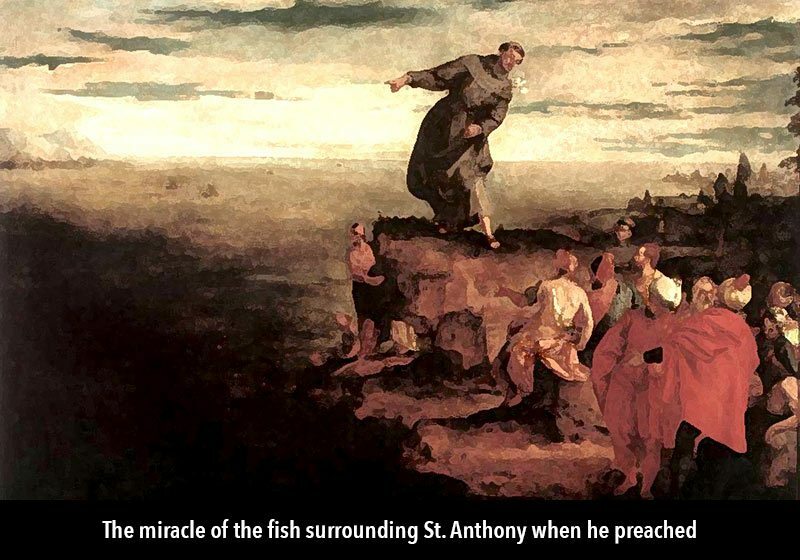 St. Anthony quickly developed a natural ability to speak passionately about the Word of God and to draw large crowds. St. Anthony quickly developed a natural ability to speak passionately about the Word of God and to draw large crowds. His mission was to preach to the many heretics who were vastly renouncing their faith. He traveled throughout northern Italy and southern France combatting abuses in the church (part of the reason why so many were leaving the Church) in the hopes of turning naysayers back to the faith. One day, St. Anthony met a heretic who said he would only believe that Jesus was truly present in the Eucharist if St. Anthony could get his donkey to bow down to the Eucharist in adoration. St. Anthony agreed and he instructed the man not to feed the donkey for three days. On the third day, St. Anthony met the man and his donkey, bringing with him the Eucharist. The man stood on one side of the stable holding a dish of the donkey’s usual oats, while St. Anthony stood on the other side holding the Eucharist. 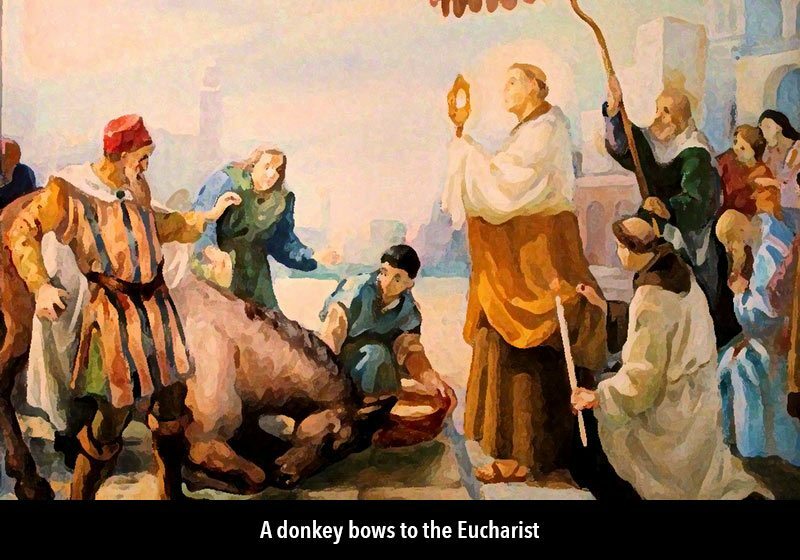 Although the donkey was starving, he immediately went to the Eucharist and bowed down in reverence. 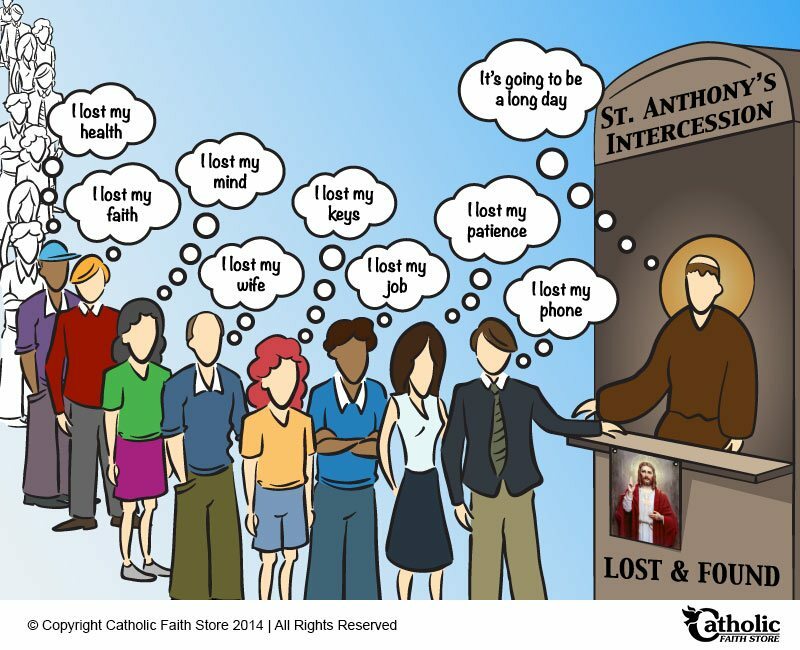 In addition to preaching, St. Anthony spent a lot of time listening to people’s confessions. One time, a young man confessed to kicking his mother. 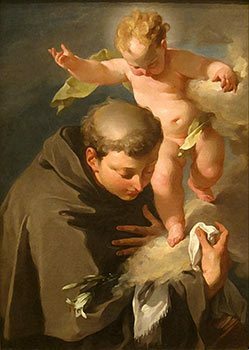 St. Anthony was so horrified that someone could cause physical harm to a loved one, especially a parent, he told the man anyone who would kick his father or mother should have his foot cut off. Taking his words literally, the man went home and cut off his foot with an ax. The man’s mother hysterically called St. Anthony for help, and when he arrived he fervently prayed to God for His miraculous intercession, and he was able to reattach the man’s foot. 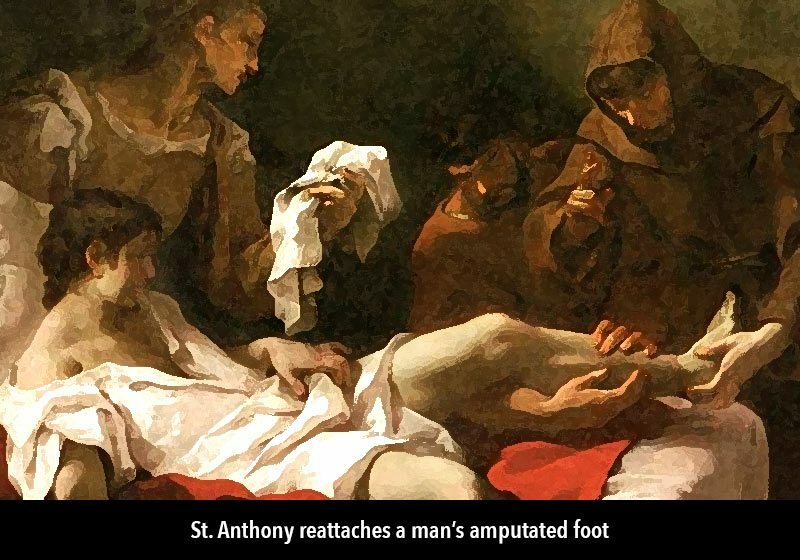 This miracle is what earned St. Anthony the title of patron saint of amputees. Popularly known as the saint people pray to for help finding lost items, St. Anthony received his own miracle when he found his lost Book of Psalms. The story goes that a young novice who recently joined the Franciscan order decided the lifestyle wasn’t for him. He left one night taking with him St. Anthony’s psalter, or Book of Psalms, that he used during his sermons. Distraught that he lost his book, he prayed to God for it to be returned. It was at that moment, that the young novice had an overwhelming sense of guilt and felt compelled to return the psalter. While preaching in the town square in Limoges, France it began to rain. The saint miraculously blocked the audience from the rain so that they could continue hearing him preach the Scriptures. When heretics offered St. Anthony poisoned food to eat, he blessed it with the sign of the cross and the food was safe to consume. While speaking to crowds at St. Junien, he predicted that the devil would try to destroy the pulpit but that no one should be afraid and that no one would be hurt. Just as predicted, the pulpit was destroyed but no one was injured and the word of God prevailed. St. Anthony died June 13, 1231, and became a saint only 11 months after his death. O Loving St. Anthony, you were a special witness of God’s power and love in your day. Hear us now as we seek your powerful intercession in our time. We lift up our prayers for all families. Help them to grow in their faith; may they persevere in unity, love, and peace. Bless our children, protect our young people, and be a companion to those in their senior years. Help them when they are tested by sickness, suffering, loneliness, or whenever they experience loss in their lives. Help all of us in our daily struggles, giving us hope and peace. Pray for us, St. Anthony, so that we may continue to grow in God’s love. Intercede for us through Christ our Lord! Amen. I share my birthday with St. Anthony and have always had a special devotion to him. My only Godson is named Anthony. Thank you so much for this article! I absolutely made my day! Praise be to God! I love the prayer to St. Anthony. Wish you the best in your future writings. God bless you always.